2019 Wyoming History Day State Contest! Time: 8:30 a.m. to 5:30 p.m.
On-Line Registration for the Contest: Closes on April 05 @ 09:59 p.m.
Monday, April 15 from 7:30-8:30 a.m.
Marian H. Rochelle Gateway Center (Websites and Papers) 222 South 22nd St.
Papers: Upload a pdf to your registration profile by 09:59 p.m.(MDT) on April 05. Printed copies MUST arrive by Monday, April 8, 2019. * This schedule is subject to change. Special Awards: Over $9000 in cash and scholarships are available to students thanks to the generous support of many individuals, businesses and organizations throughout Wyoming. To be considered for a special award, students competing at State must nominate themselves in advance during online registration. Please limit your choices to the awards which match your project. For example, if you didn't conduct an oral history interview for your research then don't nominate yourself for the William H. Barton Award. **Special Awards and Scholarships marked with an **REQUIRE the submission of your process paper and annotated bibliography, both electronically (combine your process paper and annotated bibliography into ONE document) and mail FOUR printed copies. **Students won't be able to see the "Special Awards Nomination" tab until after they have filled out the Permission/Waivers page of registration. Once you save that page, a page will populate that says "Registration Fee Payment Method" at the top, select Pay by Check (even if that is not how you will pay). The page will populate with two light blue sections and a yellowish section, under which on the left side of the page it will ask you to click "I Agree". Click the "I Agree" button. The page will repopulate again with the Special Awards Nominations tab. It's light blue with white writing on the left hand side. **If you don't see the Special Awards Nominations tab during your regular registration you can access it from your MY PROFILE tab under your login name (in the upper right corner of the main page). 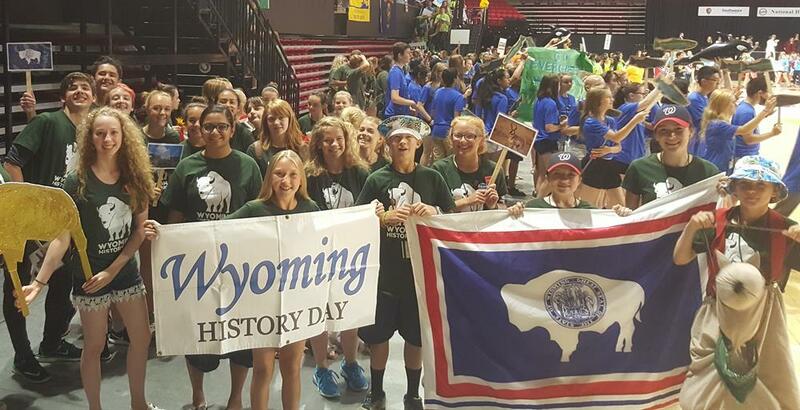 The annual Wyoming History Day State Competition is open to qualifying students in the Junior and Senior age divisions. The top three entries from each of Wyoming’s seven regional contests qualify to advance to the state contest. After the state contest is decided, the first and second place finishers in each category will advance to the national competion at the University of Maryland. We are thrilled that you are participating the 2019 Wyoming History Day State Contest! The National History Day program is an excellent opportunity for you to develop critical thinking skills, analyze multiple perspectives and conduct in-depth research about a topic in history which you are passionate about. You'll have an opportunity to meet other students from across Wyoming and witness their passion for history through the 2019 Theme "Triumph and Tragedy in History"
You MUST be registered by Friday, April 05 at 9:59 p.m.
Websites and Papers must be uploaded by April 05 at 9:59 p.m. Websites will lock at the same time, thus you won't be able to make changes after April 05 @ 9:59 p.m.
Click on the "Create Account" Tab above or use the sidebar to "Create Account"
From the drop down menu/list, select "Student"
Special Awards: You may self nominate for special awards. Be sure to read over each award description to determine if you are eligible for that award. For example, if you did a project about the Medicine Wheel you would NOT be eligible for the homesteading or women's history awards, etc. Scholarships: You are only eligible for scholarships if you are in the 11th or 12th grade. Sweatshirts (Zip-Up) with hood...Black with 2019 WHD logo on the back. Wyoming History Day T-Shirts color TBD. T-shirts are made of poly-cotton (tri-blend) short sleeve crewneck. If you decide you'd like a t-shirt or sweatshirt after you see them at the state contest, you may order one at that time. You must pay for the product, plus $5.00 shipping in cash or check during the state contest on Monday, April 15. Students are expected to conduct themselves, in person and online, in a manner that brings credit to themselves and their schools. Treat other competitors with respect at all times. All students must be accompanied by a teacher or chaperone while at the contest. Chaperones are responsible for the behavior of the students in their charge. Pack out everything you pack in, including contest supplies. Please, do not leave exhibits or performance props behind. We are guests at the University of Wyoming and want to be invited back. Students are expected to be respectful of the space and all members of the Wyoming History Day community. Be conscientious and supportive towards your peers. Welcome WY Educators to the 2019 WY History Day State Contest! We are excited to witness the projects your students developed for the Wyoming History Day state contest. Your commitment to the National History Day program is greatly appreciated. We look forward to seeing you on April 14-15, 2019 in Laramie on the University of Wyoming campus. Teachers need to register prior to their students registering. Click on the "Create Account" tab above or in the sidebar. All students must register for the State Contest by Friday, April 05 @ 09:59 p.m. Create a Username and Password to access registration. You can view your students' registration information under My Students. Welcome JUDGES to the 2019 WY History Day State Contest! We are thrilled that you have agreed to spend time with WY History Day to evaluate primary source based research projects from 6th-12th grade students from across the state. Your commitment to the National History Day program is greatly appreciated. We look forward to seeing you on April 14-15, 2019 in Laramie on the University of Wyoming campus. ALL Judges must create an account to register for the WHD State contest. Click on the "Create Account" tab near the top of the page or click "Create Account" on the sidebar. Learn about the 2019 NHD Theme, Triumph and Tragedy in History. Review the NHD Contest Rule Book. All judges should register/create account for the State Contest by April 05 @ 09:59 p.m. If you are willing to evaluate papers or websites, you'll receive electronic copies of papers and links to websites by Sunday, April 7. HARD Copies of papers will arrive in the mail a few days later. GOOD NEWS! This year, the NHD Registration system added the ability for judges of all categories to make their comments through the registration system utilizing a computer/laptop. If desired, you may do this. If you evaluate papers or websites you may start/finish your comments prior to April 14. If you evaluate documentaries, performances or exhibits, you'll be able to write comments, via computer, on Monday, April 15. We will NOT have computers available for this. You MUST bring your own.